The third annual ChiTeen Lit Fest is April 13 and 14. Register online now! This festival, created by teens for teens, celebrates all things literature. 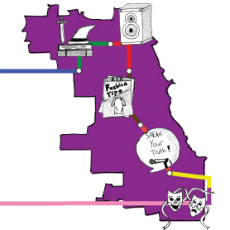 ChiTeen Lit Fest seeks to bring together young people from across Chicago and celebrate their talents as they express themselves through exceptional and honest art. Cyrus from Dr. Martin Luther King Jr College Prep High School is excited for ChiTeen Lit Fest and returns for his second year on the fest’s Branding Team. Branding Team members are responsible for creating the fest’s website and graphic art, as well as contributing to social media. See the Branding Team’s work at ChiTeenLitFest.org! Q: What program or workshop are you most excited to attend at the fest and why are you excited about it? A: I am most excited for Now that We’re Men: A Conversation because I enjoyed talking with Katie Cappiello about her play and vision for a society without toxic masculinity. Q: Why do you think teens should go to ChiTeen Lit Fest? A: CTLF is a cool place to meet other teens and artists, writers, and activists. It is a new world, of sorts. Q: How have you been involved with the Branding Team? A: I have been involved with the branding team for almost two years. I have mostly done graphic design and video editing. See the entire ChiTeen Lit Fest schedule and plan your fest experience at chiteenlitfest.org/schedule. To see this year’s headliners, connect on social media and see CTLF partners, visit chipublib.org/chiteenlitfest.